- Open Taco Finder on your iPhone or iPod Touch. - Follow the whimsical wooden arrow to your taco. 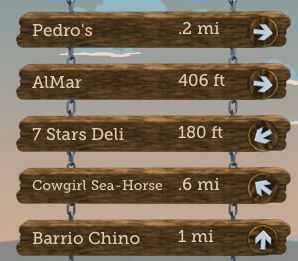 - Note the informative bottom bar - it displays the distance to your taco destination. - Optional: Celebrate your taco tracking skills with a taco! And there you have it. Tacos found.